Inland Ports « What Happened to the Portcullis? On Thursday, 4 January 2018, Nigeria’s President, Muhammadu Buhari, inaugurated the Kaduna Inland Dry Port and warned the Nigeria Customs Service and port officials against frustrating the effective use of the facilities. Inaugurating the facilities in Kaduna, Buhari said the customs and the port officials must make the facilities work and not to frustrate business, commercial and industrial enterprises with unnecessary bureaucracy. 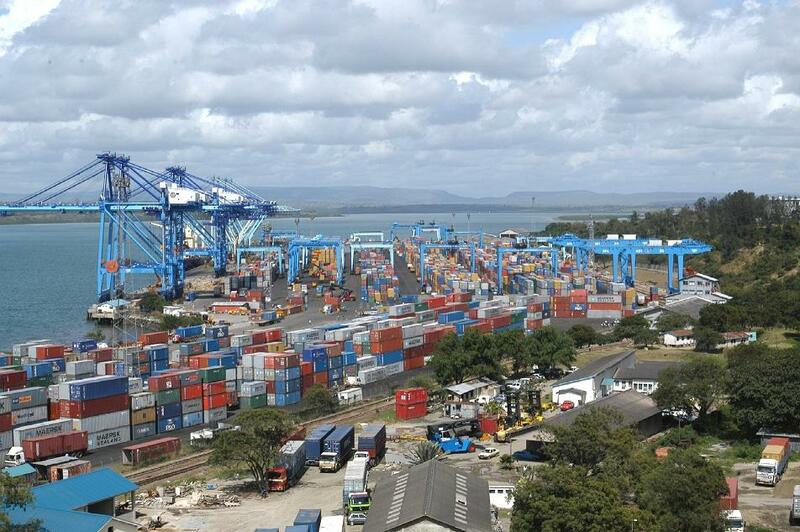 It remains for Customs and Ports officials to make these facilities work and not to frustrate business, commercial and industrial enterprises with unnecessary bureaucracy and inflicting on them delays and hardships, thereby defeating the object of the whole exercise as has happened in the past. According to him, the hinterland business community has waited for too long for such facility that has tremendous potentials to ease the way of doing international business for the interior based importers and exporters. He said that the development of Inland Dry Ports was an important factor in the nation’s economic development efforts. As Ports of origin for exports and ports of destination for imports, the Inland Dry Ports will accelerate the implementation of our economic diversification policy. “The concept of Inland Dry Port has gained widespread importance with the changes in international transportation as a result of the container revolution and the introduction of door-to-door delivery of cargo. It provides importers and exporters located within the nation’s hinterland, especially industrial and commercial outfits, access to shipping and port services without necessarily visiting the seaports. “It also enables them to process clearance of their import cargo and take delivery of their raw materials and machinery close to their places of business. President Buhari also said that the Dry Ports would provide exporters the much-needed facilities to process, package, consolidate and forward their exports to their customers all over the world without having to physically be at the seaports. According to him, this replicates the port economy in the various centres where the Dry Ports are located inland thereby generating employment and contributing to the ease of doing business. He said in addition to the Kaduna Inland Dry Port, six other Inland Dry Ports in Ibadan, Aba, Kano, Jos, Funtua and Maiduguri, which had also been gazetted, were at various stages of completion. He congratulated the Kaduna State Government, the Federal Ministry of Transportation, Nigerian Shippers’ Council as well as the hinterland importers and exporters on the inauguration of the facilities. The president also commended the initiative of Nigerian Shippers’ Council towards promoting the provision of these modern transport infrastructural facilities. He, however, urged the Concessionaires of the other six Dry Ports to emulate the Concessionaires of the Kaduna Dry Port by accelerating work on theirs so as to ensure speedy completion of the projects. He said that with the full complement of the seven Dry Ports, congestion at the seaport and traffic gridlock in the port complex would be eliminated. “Consequently, the cost of transportation and cost of doing business will be reduced,’’ he said. He lauded the efforts of the Kaduna state government for facilitating the establishment of Kaduna Inland Dry Port. According to him, the provision of access roads and other utilities to the Dry Port by Kaduna State Government is worthy of emulation by the other Dry Ports host State Governments. Yes, the info junkie I am – this is what I was really after! The WCO chose to delay the real stuff. The WCO has published its Transit Guidelines, and a substantial compendium its is. Click here to access/download the file (5,4MB)! The WCO Secretary General, Kunio Mikuriya, has noted the possibility of developing a separate publication on transit encompassing national or regional best practices. At the recent conference on transit, particular attention was given to the difficulties faced by landlocked developing countries. During a special session on the issue, the United Nations Office of the High Representative for the Least Developed Countries, Landlocked Developing Countries and Small Island Developing States (UN-OHRLLS), several concrete suggestions were made on how to turn land-lockedness into land-linkedness. The Director General of Paraguay Customs indicated that trade transactions in his country incur 30% additional costs due to Paraguay’s geographical limitations. The Representative from UN-OHRLLS confirmed that on average, LLDCs bear up to 40 % additional costs on trade transactions. The investment being made in hard infrastructure, such as roads, rail infrastructure, intermodal logistical hubs and dry inland ports, remains one of the main priorities in order to improve the situation. 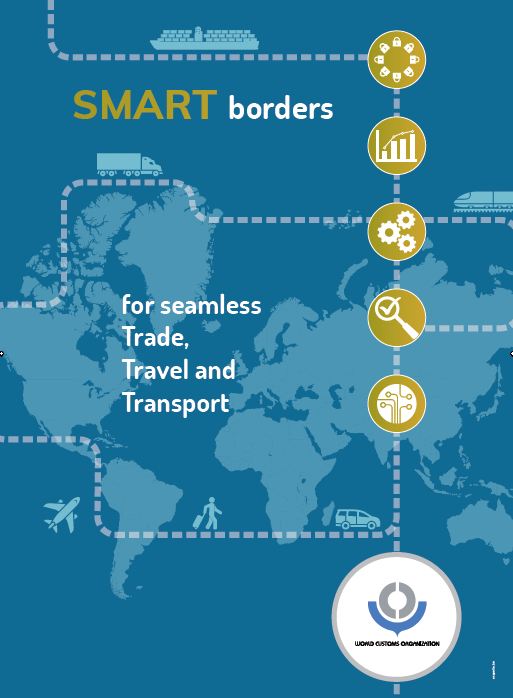 Participants confirmed the need for harmonization and simplification of border control procedures, as well as the promotion of ICT for the management of transit systems. This is of significant importance to LLDCs in Africa of which there are eight!. Representatives from several of Africa’s Regional Economic Communities present at the Conference, such as the Common Market for Eastern and Southern Africa (COMESA) and the Economic Community of West African States (ECOWAS), also highlighted the need to ensure that establishment functioning legal frameworks are in place to address the main challenges of regional transit regimes. The use of existing information and communication technology (ICT) solutions was also raised at the Conference. Today, numerous technologies are available to secure the movement of goods, such as electronic Customs seals which are actively used on containers transported from China to Europe and have proved to be reliable and efficient. The regional electronic tracking system used for goods transiting between Uganda, Kenya and Rwanda was also mentioned as a successful project resulting from cooperation between neighbouring Customs administrations. The Representative from ECOWAS informed participants that work has started to connect the IT systems of ECOWAS Members. Regarding the challenges related to interconnectivity, the benefits of global implementation of the WCO Data Model were pointed out. Railway transport is playing an increasingly important role in moving goods between countries in Eurasia, as explained by the Representatives from China and Russia Customs as well as the Representative from the Intergovernmental Organisation for International Carriage by Rail (OTIF). It was pointed out that block trains now bring goods from China to Europe through Russia and Central Asian countries within a fortnight; four times faster than via maritime routes. It is worth nothing that in the absence of a global instrument regulating the movement of trains across borders, which would obviously be of benefit to transit operations, bilateral agreements are the norm. The World Customs Organization (WCO) organized a National Workshop on Inland Depots under the sponsorship of the Customs Cooperation Fund (CCF)/Japan and the Japan International Cooperation Agency (JICA). It was held from 20 to 22 September 2016 in Savannakhet Province, Lao People’s Democratic Republic. Twenty six Customs officers from the Lao Customs Administration participated in the workshop, along with guest Customs experts from The Former Yugoslav Republic of Macedonia, Japan and JICA. Mr. Somphit Sengmanivong, Deputy Director General of the Lao Customs Administration, opened the workshop. He highlighted the importance of Inland Depots as a national strategy to secure his country’s economic growth and sought participants’ active participation in the discussions on this topic. Presently, there is no clear definition of “Inland Depot” and many similar terms, such as Dry Port, Inland Terminal, Free Trade Zone and Special Economic Zones, are used in the international logistics. During the three-day workshop, participants discussed the functions and a possible definition of Inland Depot from a Customs perspective. Comment – Inland container terminals serve as important hubs or nodes for the distribution and consolidation of imported and export destined cargoes. There are 16 Landlocked countries in Africa, which signifies the importance of hinterland logistics development and its consequential impact on regional trade groupings. Consequentially, it behooves governments to understand and support the logistics supply chain industry in maximizing inland transportation (multi-modal) infrastructures to achieve a common and mutually beneficial economic environment. Furthermore, the more facilitative these arrangements, the better opportunity there is for success and longer-term economic sustainability. The WCO Secretariat made presentations on international standards for relevant procedures, including Customs warehouses, free zones, Customs transit, inward processing, clearance for home use and temporary admission. Experts from The Former Yugoslav Republic of Macedonia and Japan described their national and regional experience of Customs warehousing, and Customs transit procedures. The JICA expert presented the bonded procedures applied by neighbouring countries to Lao People’s Democratic Republic. Lao Customs administration explained their national system for Inland Depots and a logistics company of Lao PDR shared its expectations on inland depots. The following was penned by a long-time customs acquaintance Aires Nunes da Costa, who has kindly permitted me to post his article titled “Why unpack containers in Durban if you can have containers at your door step in Gauteng within 24 hours?” which first appeared on LinkedIN. The Tambo Springs initiative involves creating a significantly improved intermodal capability for the movement of freight to and from Gauteng. This is to be achieved by the operational twinning of the inland port with other seaport, inland and cross border locations. The connectivity i.r.o. these twinned locations is achieved via sea, rail, road and air linkages, ideally involving seamless movement of freight between modes. The Tambo Springs development incorporates a next generation inland port with a state of the art rail terminal facility designed to be developed in phases, with an ultimate capacity of 1 m TEU’S p.a., as well as, a sprinter freight land bridge. In addition to the direct rail link with Durban harbour, the initial phase of this programme involves the twinning of the Coega IDZ and its adjoining Deep Water Container Terminal at the Port of Ngqura with Tambo Springs. This is to be undertaken by means of a Public Private Partnership type structure which utilizes the Transnet capability between the two locations as well as the participation of SARS. The service level to be achieved for the movement of the freight via this land bridge has a goal of “24 hours” as opposed to the current 3 to 5 days service level achieved at City Deep. This is to be achieved by capitalizing on the creation of high efficiency intermodal activities integrated with the port functions and feeder network. The Tambo Springs Inland Port will function as a multimodal logistics gateway serving the Gauteng Catchment area. It therefore provides ease of movement between individual transportation modes in addition to facilitating manufacturing, warehousing and distribution activities. The operational plan is therefore designed to accommodate long distance (FTL) truck traffic in addition to regional (LTL) freight movement. LTL truck and Van short distance movement of freight, including a regional metropolitan distribution function. The next generation inland port therefore capitalizes both on rail and road transportation modes with a focus on increased movement of long distance freight by sprinter rail. 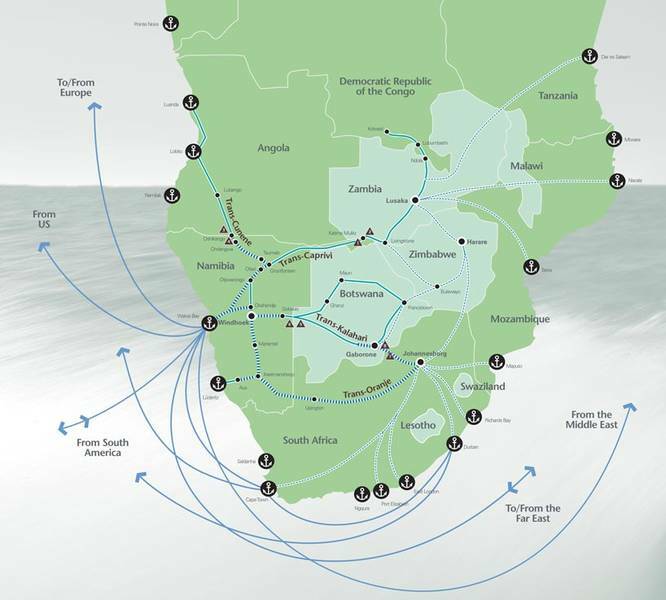 In order to achieve seamless intermodal movement of freight between sea, rail, road and air transport, it is essential to link Tambo Springs with other inland port and hub locations. The creation of such a twinned Inland Port Network provides a means to effectively participate in the Global Supply Chain in a manner which optimizes both existing and new facilities to enhance capacity. Hence, for example, Tambo Springs would be linked to City Deep via rail and road linkages and to other hub locations in Gauteng and elsewhere. South Africa’s freight and logistics company Transnet this week launched its massive drive to bring private sector operators into the country’s freight system. The company has issued a request for proposals inviting suitably qualified global logistics service providers to design, build, operate, maintain and eventually hand over its proposed inland container terminal in Tambo Springs, East of Johannesburg – a 630ha site located on land originally known as Tamboekiesfontein farm. The concession will be over a 20-year period and will be Transnet’s biggest private sector participation project to date. The proposed terminal is in line with Transnet’s drive to migrate rail friendly cargo off the country’s road network. The terminal is expected to be in operation by 2019 and will have an initial capacity of 144 000 TEUs per annum, with an option to ramp it up to 560 000 TEUs, depending on demand. Transnet Freight Rail will be responsible for the operation of the arrival and departure yard required to service the terminal. The operator will be responsible for loading and offloading of containers and marketing of the facility. The winning bidder is expected to introduce new entrants – particularly black players – must have demonstrated technical expertise, a minimum of level 4 BBBEE status with a commitment to reach level 2 by the third year of operation. Transnet currently operates 5 inland terminals in Gauteng, including the City Deep Container Terminal in Johannesburg, Africa’s largest inland port. The proposed terminal is an integral part of the Presidential Infrastructure Co-ordinating Committee’s SIP 2, aimed at unlocking the country’s industrial development while boosting export capability. It is designed to complement Transnet’s container-handling capacity in the province. This is the culmination of years of hard work and a demonstration of cooperative governance between Transnet, representing the national competence, and both the Gauteng Provincial Government and the Ekurhuleni Municipality. The Tambo Springs terminal is one of three mega terminals that Transnet is planning to build in Gauteng over the next 20 years. It will be located in Ekurhuleni along the N3, just off the Natal Corridor. The Almaty Programme of Action (APoA): Addressing the Special Needs of Landlocked Developing Countries within a New Global Framework for Transit Transport Cooperation for Landlocked and Transit Developing Countries was adopted in 2003 as a response to the growing recognition by the international community of the special needs and challenges faced by the LLDCs. The Programme of Action emphasised five priority policy areas that landlocked and transit countries need to address to resolve the access problems of LLDCs: Transit policy and regulatory frameworks; Infrastructure development; International trade and trade facilitation; International support measures, and Implementation and review. As one of the priority areas of the APoA, international trade and trade facilitation (streamlining customs and other border procedures) has taken on renewed focus, especially in light of the WTO Bali Ministerial Conference in December 2013, at which WTO members reached consensus on a Trade Facilitation Agreement, as part of the wider ‘Bali package’. As the end of the first ten years of the APoA is drawing to a close, the General Assembly of the United Nations decided to hold a comprehensive Ten-Year Review Conference of the APoA in 2014. The WTO Trade Facilitation Agreement sets out commitments that promote clear rules and procedures, many of which are of particular interest to LLDCs. The three most important provisions for LLDCs are Articles 11, 10,and 8. The first one deals specifically with freedom of transit, the second sets out obligations in relation to trade procedures including transit, and the third requires WTO members to cooperate with other members with which they share a common border. Other TFA provisions of interest to the LLDCs include Articles 1-5 which addresses Publication and Transparency, including the availability of information; Article 2 which provides specific guidance on Consultations before Entry into Force; Article 6, which sets out Disciplines on Fees and Charges imposed on or in Connection with Import and Export and Article 7 which provides rules on Release and Clearance of Goods, including Trade Facilitation Measures for Authorised Operators. In the new Agreement, the obligations take three forms: Binding, Best Endeavour, or a Combination of both. The TFA presents an opportunity for LLDCs to upgrade their systems, infrastructure and procedures as the Agreement encourages national trade facilitation improvements. Policymakers should therefore ensure that trade facilitation is included in national development plans given the cross cutting nature of trade facilitation. Using this approach, LLDCs will increase their ability to access resources tied to different funding windows, for example, assistance for general trade policy and regulations. There are 16 Landlocked countries in Africa, which signifies the importance of the WTO TFA and its consequential impact on regional trade groupings. The WTO TFA is an innovative agreement as it will provide capacity building to developing countries to allow them to undertake the implementation of the agreement where necessary. The Agreement addresses concerns about the implementation costs and capacity building constraints in developing and least developed countries that would be required to implement these rules. The Agreement allows each LLDC to design its TFA implementation plan and choose a timetable of compliance in accordance with its needs, capabilities and confirmed funding and technical assistance from development partners. Further, guidance is provided to WTO members on the domestic institutional arrangements that should be established to maximise the resources to be made available by donors, as well as the structures and systems that should be adhered to at the WTO Secretariat itself to ensure that the process of accessing TFA implementation support is transparent and inclusive. It is essential to note that the Agreement specifies a strict national approach to implementation and makes no provision to resolve the issues which are closest to LLDCs interests, such as regional economic corridors, which fall outside the purview of the WTO’s multilateral disciplines. Despite this shortcoming, LLDCs will benefit from deepening their links and their involvement in fora supported by the development banks and bilateral agencies which fund these regional programmes. This will ensure that their interests are adequately reflected in the design of development plans for regional infrastructure improvements, regulatory reforms, technical assistance and capacity building. Although the language of the TFA is legally binding in relation to some key aspects of freedom of transit, it has one important proviso. If an LLDC developing country neighbour denotes freedom of transit as a Category C obligation, it will only become justiciable and fully legally binding after the expiration of the transition date determined by that country and the delivery of suitable technical assistance by donors. Against this background, an optimal outcome for LLDCs would be that as many transit countries as possible register freedom of transit as a Category A obligation, as this would come into force immediately. Read the full preparatory report on the Implications of the WTO ATF on Landlocked Developing Countries, available on the United Nations Conference on Landlocked Developing Countries website. The Botswana dry port in Walvis Bay is expected to be operational this week, Botswana Railways’ Commercial Manager Mthulusi Lotshe said last week. The dry port will cost N$60 million. The Botswana dry port is constructed on land owned by NamPort. The facility would be used exclusively by Botswana Railways for handling both containerised and non-containerised cargoes for import and export to, or originating from this eastern neighbouring country. Lotshe made the announcement during the Trans Kalahari Corridor (TKC) information session hosted by the Trans-Kalahari Corridor secretariat in Windhoek. He said the objective of the dry port is to consolidate maritime goods into inter modal and long distance transport flows. 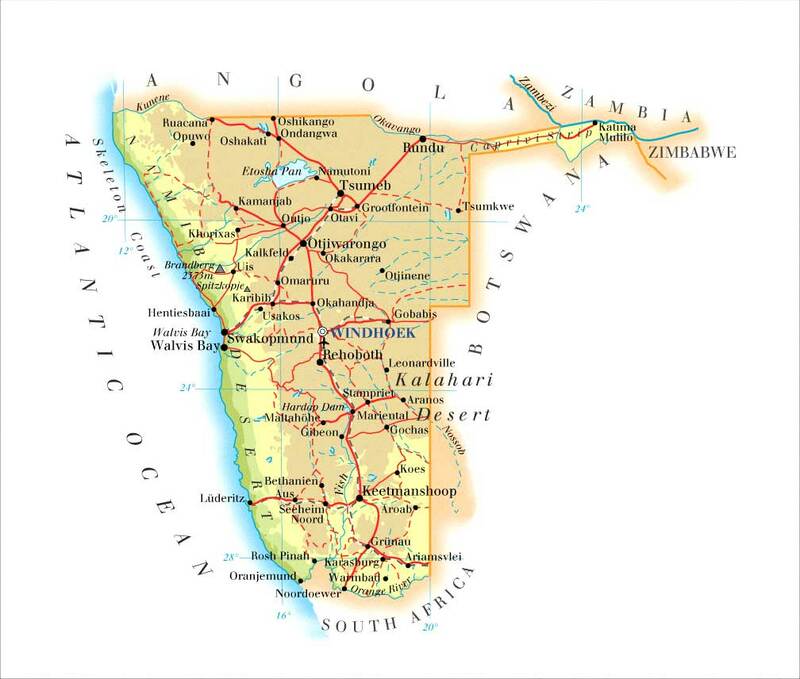 “The other objectives of the dry port include improving cargo processing through coordinated operations; facilitating collection and distribution of local, regional and international transport; and integrating Botswana and the Southern African Development Community region with the Walvis Bay port,” Lotshe said. The reliability of African ports for import and export traffic is likely to deteriorate before getting better, according to Portoverview.com which advises importers, exporters and traders in planning their supply chain to and from the continent. Speaking earlier this week at the Cool Logistics Conference in Cape Town, Africa. Portoverview.com’s Victor Shieh said almost 2,000 incidents were recorded on its portal over the last 16 months, with an average of one weather-related incident per day for South Africa alone. Current congestion issues will remain a problem whilst port infrastructure is renewed over the next years. However, we see African hinterland connections beyond the terminal gates as the biggest challenge facing shippers,” Shieh emphasised. In a study presented at the conference, road and rail construction as well as investment in port infrastructure were identified as the main positive developments recorded on the portal. Greenfield sites along the African coast are cited as having the greatest potential to improve cargo efficiency. Projects such as the 2.5 million teu site at Lekki in Nigeria and the 5 million teu expansion at Tangier-Med, in Morocco, will require similar investments on the intermodal leg to succeed. Recent research by SeaIntel Maritime Analysis, which is co-owner of the portal, revealed that African exporters have no more than an average 60% chance that their containers will arrive on time in Asia with the percentage falling to 55% for Europe. “For shippers – especially ones who produce and distribute perishable products – that’s a real challenge” commented Morten Berg Thomsen, a shipping analyst at SeaIntel. Rapid progress is being made on a multimillion rand contract awarded by Transnet Capital Projects to Concor Civils for the construction of new concrete paving, civil services and electrical lighting at its City Deep Container Terminal. The terminal is currently being upgraded as part of Transnet’s rolling capital investment programme. The contract is scheduled for completion in May 2014 and includes the removal of 36 500 m3 of existing concrete paving, 110 000 m3 of earthworks, the installation of a new drainage system and all service ducting and manholes for lighting, fire mains, CCTV equipment, 360 t of mesh reinforcing and the placing of approximately 146 000 m2 of concrete paving. Government has decided to prioritise the passage of eight bills through Parliament. The bills deal with land restitution, labour relations, and customs and excise. 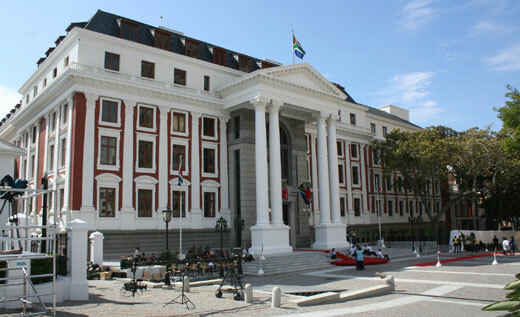 There are currently 42 bills before the National Assembly and the National Council of Provinces. With the fourth Parliament set to be dissolved ahead of looming general elections, Members of Parliament (MPs) are unlikely to deal with all 42 bills. Source: Excerpt of a press statement of the Office of the Chief Whip of the ANC, Parliament. The Common Markets for Eastern and Southern Africa has agreed to avail US$1,4 million for phase one of the construction of the country’s Walvis Bay dry port. The government of Namibia in September 2009 granted Zimbabwe 19 000 square metres of land to construct its own dry port that is expected to boost the country’s trade. The project is being spearheaded by the Road Motor Services, a subsidiary of the National Railways of Zimbabwe. In an interview, RMS managing director Mr Cosmos Mutakaya said the Ministry of Industry and Commerce last month held a consultative meeting with Comesa to strategise on how to fund the project. “Comesa is looking at funding projects with a regional integration element that countries within the Southern African Development Community would benefit from. In the last meeting we held, Comesa indicated their willingness to finance the first phase of the facility which will cost US$1,4 million,” he said. He said all the relevant documentation had been submitted and they are now waiting for a response from Comesa. Mr Mutakaya said construction of the dry port would be done in two phases. The first phase involves the civil works which includes construction of the drive-in weighbridge, storage shades, palisade fencing as well as installation of electric catwalks. 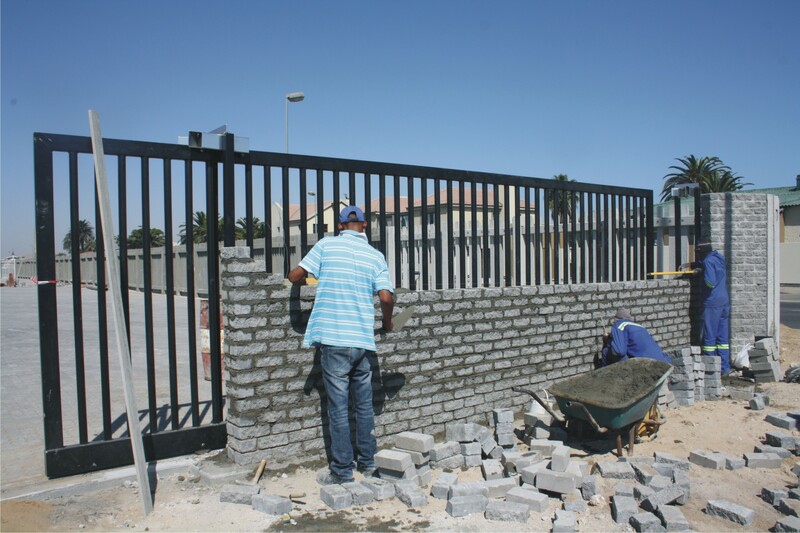 Phase two involves the putting up of administration blocks. He said once phase one is completed, then the dry port operations will start. “We are now waiting for the unlocking of funds from Treasury and Comesa for us to start construction. The Namibian contractor, Namport, will also start working on the port once the funds are made available. According to the contractor, phase one of the project is going to take five working months to complete,” Mr Mutakaya said. He said the project, which was supposed to have been completed by May this year, had been stalled by the lack of funding. An official at the Namibian desk office in the Foreign Affairs Ministry confirmed that operations at the port had stopped for a while due to a lack of funding. “Government has been facing challenges in making payments to the Walvis Bay Corridors Group, responsible for the construction at the port and operations had to be stopped for some time pending clearance of some outstanding fees by Government,” he said. Trade for Zimbabwe via Walvis Bay has increased for the past few years and a large percentage of commodities are transported along this corridor. Zimbabwe’s trade volumes through the Port of Walvis Bay have grown significantly to more than 2 500 tonnes per month. Swartbooi presented his proposal to change the face of Keetmanshoop by making it the pivot of trade between Namibia, South Africa and possibly the rest of Africa at the Annual Logistic and Transport Workshop last week. 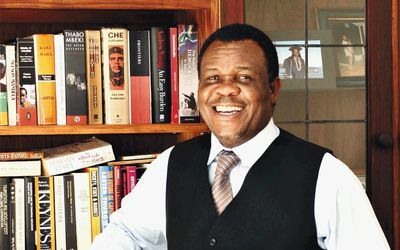 According to him the new venture, estimated at roughly N$10million, will see Keetmanshoop linked directly by sea, rail and road with Namibia’s capital Windhoek, Africa’s largest economy, South Africa, and the rest of the Southern African Development Community in the form of a central north-south transport corridor. Keetmanshoop is the only town in Namibia with eight border posts and has a working relationship with the North Cape Province in South Africa. Swartbooi said the second phase of this development will stream into the creation of a free trade zone on the eastern side of Keetmanshoop that will not only attract foreign investors but create a wealth of jobs that will significantly reduce the country’s unemployment statistics. He also mentioned that with a free trade zone the region can eventually venture into light manufacturing that will bring about positive spin-offs for the region and the entire Namibia as a whole. “We fight against a trend that the south was left out.. If you close down the Walvis Bay port today we will feel it later, but if Lüderitz port is to be closed today the effect will be felt within hours. There is no argument about our strategic location. No-one can compete against our land availability,” he enthused. Twenty hectares of serviced land have so far been secured for the project that will include two weighbridges, offload facilities and accommodation facilities for truck drivers and recreation. “We are looking at enhancing road safety and to cut down on driver fatigue,” he explained adding that key stakeholders have not yet been identified and anchor participants are being sought.. “We are looking at a private public equity where we can give someone a lease of ninety years,” he stated. According to the Director for the Namibia German Centre for Logistics, Neville Mbai, Keetmanshoop as a regional hub is a brilliant idea and will not only serve as a buffer during labour strikes in South Afica, but will surely ease the burden on Walvis Bay port and corridors. “It is absolutely brilliant. Kharas is adjacent to the great Gauteng region, the breadbasket of Southern Africa if not the whole of Africa. What we want to see is a shorter road from Johannesburg to Namibia. Look at the road infrastructure of Walvis Bay, if we are to add more that road will be in trouble,” he said adding that with Keetmanshoop providing a hub Namibia will no longer be severely impacted by labour strikes in South Africa, as goods can be stored to cater for the Namibian market. “The idea must be to have a concentration of logistics hubs scattered across the country and with the port of Lüderitz and the quantity of fish production the region certainly is deserving of a hub,” he noted. At least 1 600 trucks pass through Keetmanshoop on a monthly basis with 80 percent of Namibia’s goods being are transported through this route. 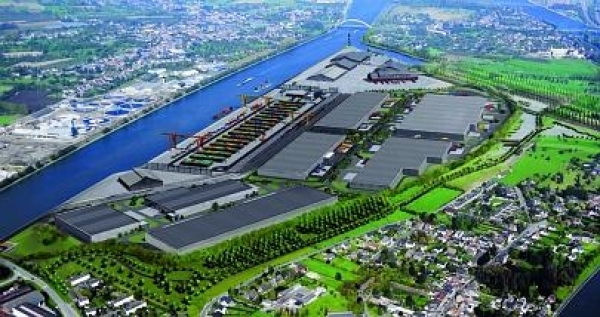 Work is underway on a major multimodal logistics hub project in Belgium. Piloted by the inland port of Liège, it is designed to serve as an “extended gateway” to the seaports of Rotterdam, Antwerp and Zeebrugge. The project will attract around €45 million of public funding from the Belgian authorities and the European Union to finance infrastructure requirements, while initial investment from the private sector is estimated at approximately €115 million. Located on a 120 hectare site on the banks of the Canal Albert, the Trilogiport project is scheduled to be operational in the second half of 2015. It is expected to create more than 2,000 direct or indirect jobs. Described as “a tri-modal (river, rail and road) logistics village,” it will comprise a 15ha container terminal, with 1,850 metres of quayside, operated by Luxembourg-based Euroports and its partner, DP World. Provision is made too to build a rail freight terminal with 700 metres of track to connect Trilogiport with the national rail network. Construction of a road bridge is also planned to provide access to the motorway system around Liège.